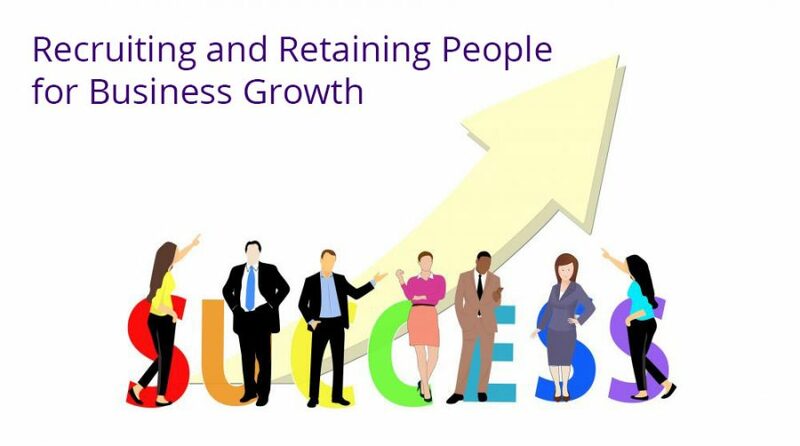 Recruiting and retaining people are essential aspects to grow your business. You need solid foundations to be a preferred employer and build a motivated and engaged team. People are dedicated to grow the business in a culture of continuous improvement when they are engaged. The team will be proud to take ownership of future success, quality, reliability and job satisfaction. The frequent barrier to success is the lack of quality people. This was identified at a recent Vector Meeting with FastGrowth Services. The event’s focus was on growing and scaling the business to achieve a consistent >20% growth each year. A board of entrepreneurs, from a varity of companies, meet monthly to challenge and support each other in achieving this. They have some remarkable results. Across many industries, not just the NHS, it is getting harder to find, recruit and retain people. This situation is likely to worsen after Brexit. You know you require people with the necessary knowledge, attitude and skills to build sustainable growth. The foundations to achieve this are inspiring vision and values, the right culture, consistent quality processes, good leadership at all levels, and an overt development pathway. A vision is an inspirational aspiration. It gives your team a clear picture of what you aim to be doing in the future. This allows people to understand where they are going and how their work will contribute to getting there. It gives them an incentive to follow you as a leader. From the vision come the culture, values and behaviours required to achieve this. Values signify the principles or moral standards of a person, team or company. It is what is considered to be valuable or important to them. They form a bond and set expectations of ways of behaving or how not to. They underlie our everyday relationships with each other. A job can be achieved without values in a utilitarian way, but a focus on values can enrich the quality of the relationships within an organisation or team, and therefore its effectiveness. People will do their job because they want to rather than having to. The company values need to resonate with their own core values. They create unique energy. They are not a ‘soft’ management approach, but they enable people to do the toughest of jobs fairly and with greater satisfaction. Values cannot be seen or touched, but they do have impact. Managers ignore them at their peril. As a leader, you need to agree and communicate them, be a role model and have systems in place to allow them to be expressed. Unless the central values are converted into operational reality; in terms of acceptable behaviours; they are just words on a page. Do your team know and buy into the vision and values? How do leaders role model the desired behaviours on a daily basis? The right culture is created by setting the required behaviours, role modelling them and holding people accountable to them. This starts at the top. Where people feel safe, valued and respected; fear and threat are taken out of the equation. The team can then focus their minds on the job and innovation. Wellbeing, especially mental resilience, is an important aspect of growth. Neuroscience research has identified what the brain needs to be effective. David Rock, Neuroleadership Institute, created the model of SCARF to explain this. This represents the interpersonal primary rewards or threats that are important to the brain. If you can find ways to increase several of the elements of SCARF at the same time, either in yourself or others, you not only have a powerful tool for feeling great, but also improving performance. You can demonstrate compassion by providing what the brain craves. You are likely to feel calmer, happier, more confident, more connected, and smarter. Are your team engaged with your culture? What could you do to increase the SCARF in your business? The cornerstone of recruiting and retaining people is having the right systems and processes in place. When you start out in business, you may not need these as much, but the more people you employ, the more important they become to ensure certainty and fairness. If you are not sure what processes you need to have or how good they are, I recommend speaking to an expert in this field. One key people process I find lacking in many businesses is quality induction. Good induction helps with certainty and relatedness. The new person knows who they work with and helps them feel part of the team. It makes them feel a valued addition to the business and provides certainty of expectations. Recently, a team told me they don’t bother to introduce themselves or speak to a new member of staff because they rarely stay very long! I wonder why? One of the team had been there nearly a year and most people didn’t know who he was or what he did. He wasn’t too sure either as he had no job description. Are there critical gaps in your systems and processes? How thorough is your induction process? How many times do we hear a business is failing because of lack of leadership? It could be an easy ‘scapegoat’ I suppose. From my experience, people are too often promoted because they are good at what they do, but are not given the adequate training to mange and lead people. Managers can get the job done. Good leadership engages and inspires the team. Great leaders build trust. The traditional ways of treating people at work are failing. Research tells us only 30% of employees are engaged. This is not going to get you the growth you want. The new generation of employees are more likely to ask ‘why should I be led by you?’ You can develop new style leaders, who challenge the status quo and inspire their teams in difficult times. How can you improve leadership at all levels of the organisation? Success is based on developing people with the right skills, knowledge and attitude. One of the key motivators for many is seeing progression and development in their role. If you are going to get sustainable business growth then your team also need to grow. More of the same will not guarantee survival, especially with the speed of change and technology. If people have a clear and structured development pathway, it creates a sense of being valued, certainty, and fairness. You are then not expecting them to do what they have not been trained to do. If they can have some autonomy in how they develop, then it can be matched to their preferred learning styles. We offer a free Development Needs Audit if you require it. Do your employees see their work as just a job; or as a career? What opportunities are there for them to train and grow in their roles? As a leader, you have a critical part to play in recruiting and retaining people. Being an employer of choice has a major impact on your future business success and the development of excellent, engaged, effective teams. If you would like to discuss this further, then please contact me.